Android Device's Commonly have Auto-sync enabled when your Configure your Device for the first time with your Google Account. 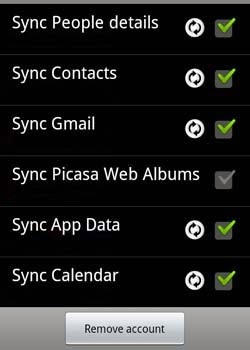 If Auto-Sync is enabled, you will have the advantage of receiving the E-mails to your device without logging in again and again, Sync your contacts, picasa albums,calender,app data etc with your Email Id. When you link your Email Id with Another Device, the Contacts,calender,app data etc will be restored to your new Device. The AutoSync Feature is very usefull for Most of us, But some of us don't want picasa albums to be Displayed in our Android Gallery. If you ever tried to remove picasa albums from displaying in your Gallery and failed, you can simply remove picas albums by configuring your Google Account settings. Follow the below steps to configure your google account to not to sync picasa albums to your device..
3)Click on your Google account to open it. 4)Uncheck "Sync Picasa Web Albums"
Note: you should first enable the "Auto-sync" feature, for the check marks to be displayed. Now, you will still see the Picasa albums in your Android Gallery. This happens because of the Gallery app Cache. You should clear the Cache of the Gallery app to stop picasa albums from Displaying. 2)Click on "Manage applications" or "Application Manager"
4)Open Gallery, and click on "Clear date". This will delete the albums downloaded from picasa. It's Done, Now open Gallery App again,you will see picasa albums removed from your Android Gallery.